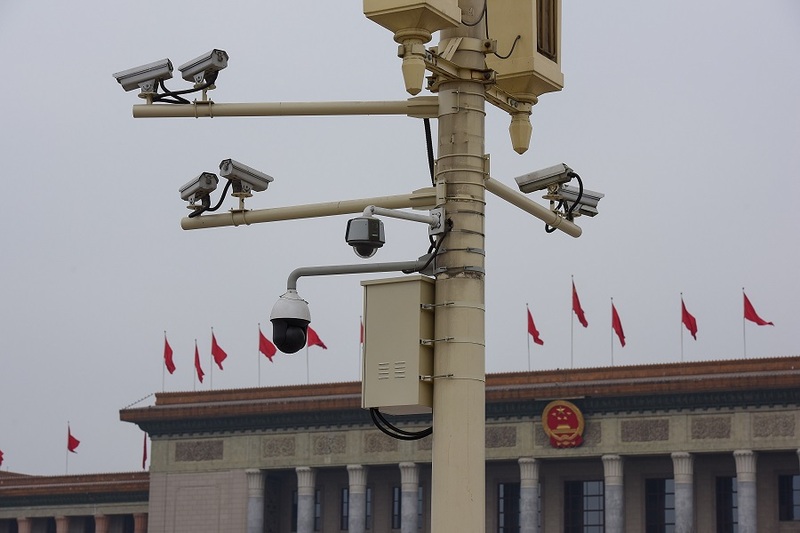 Security cameras in Tiananmen Square, Beijing, March 11, 2018. Ant Financial’s Sesame Credit is often mischaracterized as being one and the same as the Chinese government-run social credit system, yet commercial credit platforms are ultimately a small part of that wider state project. In a society where interpersonal social trust frayed over decades of political upheaval, since 2014 China’s State Council and National Development and Reform Commission (NDRC) have led the government’s promotion of the social credit system, which Chinese legal scholar Rogier Creemers describes as “a set of mechanisms providing rewards or punishments as feedback to actors, based not just on the lawfulness, but also the morality of their actions, covering economic, social and political conduct.” Social credit is thus construed as a means to repair connections between Chinese individuals, businesses, and legal institutions, and between Chinese citizens and the government itself. So far, however, the government’s social credit system has been guided by policies tested only at the provincial level, and may face steep hurdles to implementation and public acceptance if they are to go national. Unlike traditional financial credit scores, state-issued social credit evaluations are based on citizens’ information (e.g. demographics, tax fraud, social insurance payments, court orders), long collected by various branches of government. The novel element of the system is that this formerly siloed information will now be shared across government bureaus in order to assess the state’s need to impose far-reaching punishments. One example that Jeremy Daum of China Law Translate highlights is that if someone loses a lawsuit and fails to perform on the court judgment made against them (such as failing to pay a court-mandated fine), that person can now be blacklisted across multiple government ministries and face restrictions on consumption of air and train tickets, as well as lose the privilege to send their children to private schools. In some province-level pilot tests, ratings based on the information gathered are made accessible to Chinese citizens through local smartphone applications such as Honest Shanghai or credit websites tied to individual Chinese provinces. In Shanghai, third parties such as micro-loan services, bike-sharing companies, and libraries provide rewards including deposit-free or premium services to people with positive ratings, though the ratings themselves are not government-issued and appear to have no official legal status. Notably, Ant Financial is one of several private companies to sign similar memoranda on joint rewards and punishments as well as sharing “credit data” (broadly construed) with the NDRC’s State Credit Information-Sharing Platform, which claimed to have 37 “market institutions” (市场机构) participating as of September 2017. Other signatories include group discount and delivery service Meituan-Dianping and the ride-sharing company Didi Chuxing. Well before signing the memorandum, in 2015, Sesame Credit began to lower the scores of users who it discovered were on the national blacklist of debtors and judgment defaulters kept by the Supreme People’s Court. From Ant’s 2016 Corporate Sustainability Report, the company notes that as a result of this cooperation, Sesame Credit users’ scores dropped and users were restricted when seeking services from e-commerce platforms including Alipay, Taobao, and Tmall, as well as affiliated microlending, car rental, and dating services. “They were punished both online and offline. In addition, they were not allowed to take planes, soft sleepers on trains or buy luxury products,” the Ant report said. Chinese Communist Party-backed newswire Xinhua lauded Ant Financial for spurring debtors to pay up so as to raise their Sesame Credit scores. Yet it may be a while before Ant Financial gets more praise from state media. In the first week of January 2018, Ant Financial made headlines with a serious blunder that shined an unexpected spotlight on digital privacy concerns in China. Offering Alipay users online access to a summary of their 2017 spending habits, the company automatically checked a box in the contract granting Alipay the users’ consent to a Sesame Credit evaluation. Rather than asking customers to opt in, the checked box had to be un-checked by the consumer if the consumer wanted to opt out. Left checked, the box gave Alipay permission to access users’ personal financial data for credit-scoring purposes. Chinese citizens flocked to social media to upbraid the company for burying the consent in the fine print, essentially luring users into turning over their data. Ant Financial apologized on the social media platform Weibo and the company was called in by the Cyberspace Administration of China for an official reprimand. Although several news stories described this incident as a wake-up call to the importance of privacy violations in China, in fact, a small number of Sesame Credit users have been critical of the system since 2015. In a December 2017 report on the implementation of China’s social credit system, we exposed some of the critiques of Sesame Credit and other private companies’ commercial credit scoring products. We analyzed debates on Chinese blogs and question-and-answer forums such as Sina, Tianya, and Zhihu from June 2016 to June 2017. A search of posts that included one or more of the keywords “social credit system” (社会信用体系), “Sesame Credit” (芝麻信用), “honesty system” (诚信体系), “credit system” (征信体系), or “Credit China” (信用中国) revealed that virtually all critical comments related to social credit were directed at private companies’ opaque, invasive collection of personal information and avoided knocking the state-run pilot programs. A cross-check of Free Weibo, Weiboscope, and other sources that collect censored social media posts yielded no meaningful results. We were unable to explain why online critics went after the commercial companies and not the state-run data collectors that share data with these companies to restrict users’ actions (such as the above examples of Alipay blocking blacklisted people from making certain purchases). While we have yet to grasp the long-term implications of the government-run social credit system in citizens’ daily lives, the impact, both positive and negative, of Sesame Credit and other commercial credit trackers is palpable. For instance, Ant Financial’s partnerships with a host of third-party vendors—including bike- and car-rental companies, hotels, foreign consulates, and hospitals—waive deposits for Alipay users who have high Sesame Credit scores or reward them with free expedited services. By the same token, Alipay users with low scores are barred from access to such services. What incentives do Chinese regulators have to rein in tech firms’ privacy abuses given their potential dependence on private firms’ cooperation with new initiatives like the NDRC’s State Credit Information Center? Foreign observers argue that recently published Chinese standards for data privacy will bring China closer to resembling the European Union’s General Data Protection Regulation, though it remains to be seen how effectively these new standards will be implemented when it comes to limiting invasive data collection practices. Breaking laws carries a more severe penalty than does flouting standards. A September 2017 Cyberspace Administration of China review of privacy protections built into some of China’s most widely used smartphone apps—including Alipay—was incapable of preventing Ant Financial from later trying to gather user data without clear consent. Ant Financial’s recent disregard of its users’ data privacy may be the tip of the iceberg of evidence that Ant and similar companies are employing lax user protections in a thriving, highly competitive, data-driven industry.